 Commitment: This is a 3 day show (unless you have rented a Sat -Sun only space) and all vendors need to be open during show hours. If you come late or leave early you disrupt the show, your fellow vendors and our customers.  Check-In: To make check-in easier we will mail you your vendor parking pass. Please display it on your vehicle dashboard.  Merchandise: It is the sole responsibility of each vendor to protect your merchandise and display materials against inclement weather and theft. Do not extend your merchandise into your neighbor's stall or onto the road. Please keep your area clean and attractive. It helps your sales. We do experience rain, high winds, and dust from time to time. Please come prepared to secure your belongings. Remember-The market and it's owners will not be responsible for injury or property loss caused by calamitous weather, accidents, or theft.  Check-out: To reserve your space for the next month's show, you will need to pay for it by 2pm on Sunday of the current show. If you are paying with a check-submit application either at the office, or at one of the mailbox stations located by the first side door entrance in each barn. Cash payments need to be made in the office. No booth space will be reserved without payment. If you are unable to do a show but would like to reserve your space, you may sublet that space at half the rental fee until you are able to return. Subletting will be done by management-check with the office for more details. If you cancel your reservation within 10 days prior to the current show, you will receive a credit for the sublet fee which must be used toward the next months show. Any cancellations made the remaining 9 days prior to the show automatically forfeit your entire rental fee. In addition, sublet may not be possible if merchandise is left in the booth, not allowing room for the new vendor's merchandise.  Hot check charge: There will be a $25 charge for all returned checks.  Pets/Children: If you bring pets or children to the show with you, they need to be under your supervision at all times. Pets must be on a leash. Please, please pick up after your pets and remove trash from your booth before leaving.  RV Hook-up: The $45 charge for RV's is from 10am Thursday before the show until 10am Monday after the show. A fee of $15 per day will be charged for each additional day you stay (upon management pre-approval). This fee needs to be paid in advance.  Electricity: Electricity is provided as a courtesy. Please do not overload the circuits. Remember, no electric heaters or air conditioners are allowed.  Safety: Please do not stretch water hoses or electric wires across walkways where customers and vendors could get hurt. Also, please place your items carefully so as not to create a tripping hazard for shoppers.  Parking: Parking spaces are first come first serve except those reserved for RV's. 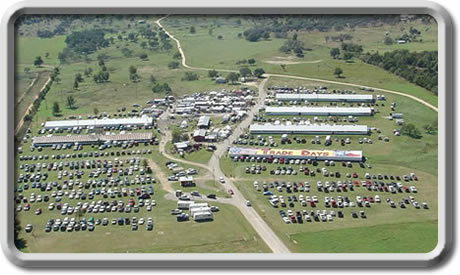 If the space behind your booth is full, there is overflow parking located to the right of Barn 6 or behind Barn 4.  No smoking in the Barns or Restrooms! THANK YOU! HAVE A GREAT SHOW!